Expert online mandatory training courses – One price gives you total compliance! Which statutory/mandatory training courses are available? Contact our Support Team if you require a tailored mandatory training package. NHS Trusts, locum agencies, nursing/care agencies and NHS purchasing organisations now insist on mandatory training that is aligned to the ‘Skills for Health’ Core Skills Training Framework (NOT All in One Day Mandatory Training). LearnPac also provides mandatory and statutory training that is Skills for Health aligned. Please ask your locum agency or employer which type of mandatory training you should complete. The Mandatory Training Group will not be held responsible if you select the incorrect mandatory training course. All our statutory and mandatory training courses can be booked online. Follow the online mandatory training booking instructions. LearnPac also delivers proven traditional classroom mandatory training which provides healthcare professionals and social care workers with relevant practical involvement and assessments. LearnPac is a National Skills Academy healthcare delivery partner. We are a leading provider of Skills for Health aligned mandatory and statutory training courses for NHS Trusts and private healthcare organisations across the UK. 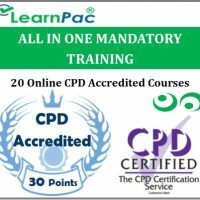 In addition to Skills for Health alignment, LearnPac’s courses are independently peer reviewed and accredited by the UK CPD Certification Service. Our Skills for Health aligned statutory and mandatory training package is CPD accredited and compliant with universally accepted continuing professional development requirements. Can these mandatory courses be used for NMC and GMC revalidation? 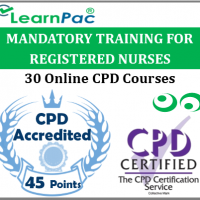 LearnPac’s mandatory and statutory training courses can be used by doctors and nurses to meet their CPD requirements for revalidation with the General Medical Council (GMC) and the Nursing and Midwifery Council (NMC). 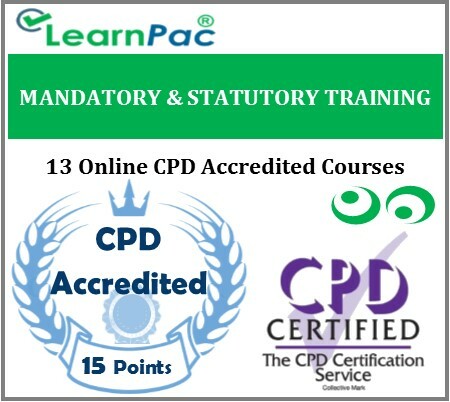 LearnPac’s mandatory training courses contribute to your individual Continual Professional Development (CPD) requirements. Any delegate attending The Mandatory Training Group’s classroom mandatory training courses or E-learning courses can use the certificates as evidence of CPD hours. Which Training Courses are Mandatory in Health and Social Care? We receive a considerable number of calls from clients, wanting to purchase the list of ‘Mandatory Courses’ for Health and Social Care staff. Clearly, this topic is causing a fair amount of confusion in the sector and so we hope this article will clarify the issue. Optional/additional mandatory training modules include: Food Hygiene/Safety, Complaints Handling, Lone Working Awareness, COSHH, RIDDOR, Awareness of Mental Health, Dementia & Learning Disability, Mental Capacity (MCA) and Deprivation of Liberty Safeguards (DOLS), PMVA/MAPA (for those working in mental health settings) Documentation and Record Keeping among others depending on your clients’ specific requirements or frameworks that you work with. 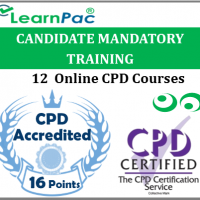 LearnPac lists a wide range of mandatory training courses which are suitable for NHS workers such as nurses, doctors and dentists. These training courses are also beneficial to care staff working in the social care setting such as a CQC registered care home or domiciliary care agency. We often get asked, “What is the difference between mandatory and statutory training?” – Mandatory training differs from statutory training as they are usually made compulsory by the organisation to ensure their employees are competent to reduce risks, follow guidelines and comply with their policies. Statutory training is required by law or a statutory body such as the Care Quality Commission has instructed the organisation to carry the training to meet legislative requirements. Read our in-depth article for more details. Mandatory training can be delivered to a group in a classroom environment such as a training centre by an experienced trainer which will cover both the theory and practical elements. Alternatively, you can purchase an online eLearning bundle which starts from around £19 per person, this would be suitable for individuals that need to learn the theory elements. You should always assess your employees including their training needs, learning styles and identify skills gaps which will help you choose the most suitable delivery method. In most cases these courses provide an all in one solution, providing an overview of all the core essentials such as health and safety, safeguarding training, equality and diversity, moving & handling, fire safety and conflict resolution. We also offer Mandatory Training bundles for Home Care and Care Home sectors which includes training for all these subjects at a discounted price. The courses considered mandatory for your organisation, will entirely depend on the care you provide and the person you support. There may also be additional requirements depending on your local authority.